Focusing on the life and work of the evangelical reformer John Bale (1485-1563), Wort presents a study of conversion in the sixteenth century. Bale wrote several accounts of his conversion over a twenty-year period. 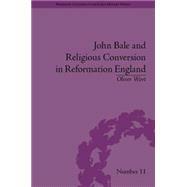 Through a scrupulous examination of these published and unpublished works, Wort reinterprets Bale's conversion, moving away from standard assumptions of a 'clean break' towards a gradual metamorphosis where both aspects of Bale's character and beliefs can be seen to coexist. Wort uses this case study to offer new insights into the English Reformation, even providing a new vocabulary for its discussion.